1. The Tosefta states a new law regarding gifts to the poor. It is not related to any Mishna. 2. Literally: the owner of the house. 3. The word כְּלִיבָה (Kliva), “box” or “container”, is an original Hebrew word which is a feminine form of the word כלוב (Kluv), meaning “cage” or “coop”. It seems that both of these words come from the root כלב (Kalav), which means “to stitch” or “twist together”. The reason that both of these words come from this root is because in ancient times most cages or containers were made by stitching or weaving branches together, usually reeds, into basket like containers. If the vessel had to be made waterproof, as in our case, then it would be covered with pitch or tree resin. It is also possible to weave a basket so tightly that it will be waterproof without a pitch or resin coating. There are variant spellings of the word Kliva, such as כליבא (Kliva) and כליכא (Klicha), however it seems to me that the spelling from the Vienna manuscript which I have quoted in the main text is the most correct spelling since it properly reflects the Hebrew origin of the word by having the letter ה (Heh) in the end and reflecting the root from which it comes from. 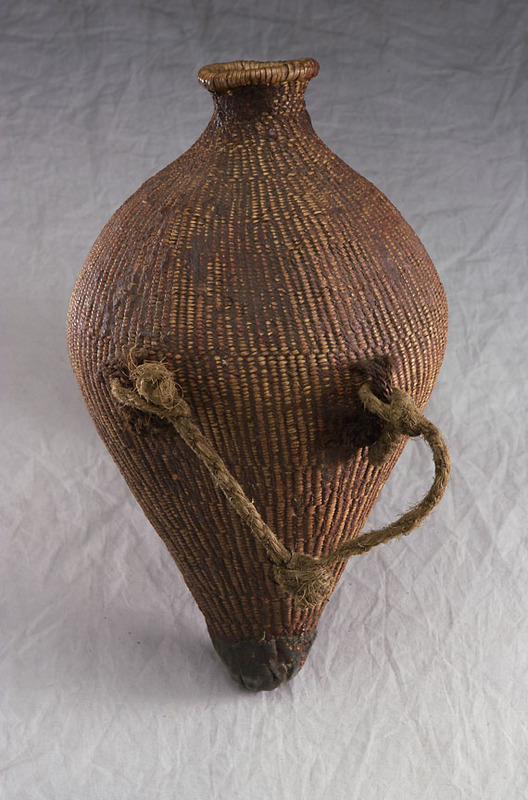 Water Basket from the 19th century made by Paiute Indians from Oregon. Oregon Historical Society Museum. Catalog Number: OHS Mus 73-126.9. Similar baskets were probably made in ancient Middle East as well. 4. It is obvious that the container has to have some produce in it which the owner gave the poor person as a gift in return for fetching him water, because if the container would be empty then the whole Tosefta would not make any sense. However, see below in the middle of note 5 where I propose a different explanation according to the Erfurt manuscript reading where the container would be indeed empty. 5. In the Erfurt manuscript the word “water” is missing. Due to this reading Cheshek Shlomo explains the Tosefta in a different fashion. He says that the owner gave the poor person a basket of produce as a gift, not as a reward for doing him a favor of fetching water, but rather because he felt bad for him that that particular poor person did not get to collect as much of the produce left as Leket, Shikcha and Peah, as other poor people did that day. According to this explanation the Tosefta is teaching us that even though the owner intended to give this produce to the poor person as a part of the official gifts to the poor that he was not able to collect himself it is still not considered to be a gift to the poor, which is exempt from tithes, but rather regular produce, which is obligated in tithes. The reason that this produce is not considered to be a gift to the poor is because all gifts to the poor have to be left in the field by the farmer to be collected by the poor themselves and not proactively collected by him and given to the poor, as I already explained earlier on a few occasions. This concept is implied in the Torah (see Vayikra 19:9 and 23:22) where the Torah uses the expression תַּעֲזֹב אֹתָם (Taazov Otam), “leave them”, meaning that the gifts to the poor should be left in the field for the poor to collect themselves. See above Tosefta Peah 2:13, note 12. However, Cheshek Shlomo’s explanation still has a linguistic problem, because if it is not talking about water, but rather simply a basket of produce, it would be much better to skip the words “to fill it up for him”, because it implies that the poor person had to go and fill up the basket with something for the owner. I would like to propose another explanation according to the Erfurt manuscript reading which skips the word “water” that would resolve this linguistic problem. The phrase לְמַלּוֹת לוֹ (Lemalot lo) could also be translated as “to fill it up for himself”, meaning for the poor person, and not “for him” meaning the owner. Then the case is that the owner gave the poor person an empty basket and told him that he is allowed to go into the field and fill up the basket from the regular crops, which belong to the owner, since there were no official Leket, Shikcha and Peah crops left in the field, because all of them were already taken by other poor people. Since these crops are regular crops that belong to the owner this particular present that the owner gave him is considered to be regular produce and is therefore obligated in tithes. According to the reading of the Vienna manuscript which has the word “water” in it the Tosefta’s point would be different. The Tosefta is teaching us that we do not suspect the owner to have taken this produce from produce which was already designated in the field as Leket, Shikcha, or Peah and belongs to the poor people, but rather the owner took it from his personal produce and therefore the poor person is obligated to separate tithes from it as from any regular produce. Another possible interpretation would be that since in this case the owner literally made a gift to the poor person as a thanks for fetching him water, the poor person might think that this gift qualifies to be an official “gift to the poor”, such as Leket, Shikcha or Peah, and therefore the Tosefta has to teach us that it is not so. Since both explanations are plausible I have decided to keep the word “water” in the main text as it appears in the Vienna manuscript. 6. As was already explained many times, all gifts to the poor are exempt from all tithes. See Mishna Chala 1:3. Since this produce is not considered to be in the special category of “gifts to the poor” the poor person would have to separate all tithes from it. For an explanation of what the different tithes are see above Tosefta Peah 1:6, note 7. 1. Mishna Peah 4:11 states that grain that was collected by ants and brought by them inside their holes is sometimes considered to be Leket and sometimes not. The Mishna clarifies that it depends on whether these holes are located in the area where above ground the grain is still standing or if it has been already harvested. If the holes are in the area where the grain is still standing then everything inside those holes belongs to the owner just like the standing grain around those holes, but if the holes are in the harvested area then the grain inside the ant holes is considered to be Leket just like the grain that is left lying in that area of the field above ground. Our Tosefta argues on the Mishna in terms of the conditions of the locations of these holes. The Tosefta argues that it does not matter in which area of the field the holes are located, and by default we always assume that the owner wants to keep the grain inside ant holes for himself, unless he specifically said that he does not care about it and anyone who wants can take it. It may seem really strange to a person from a developed country in the 21st century why it would be important to discuss the legality of grain inside ant holes. Why would anyone care about grain that was taken by ants? It is probably a small and insignificant amount. In order to dispel this question I would like explain right away the living conditions of the 3rd century CE when the Tosefta was written. In the 3rd century CE the financial situation of the Jews of the Land of Israel was very dire. There have been a few very harsh famines and at the same time very heavy taxation by the Roman authorities. It was so bad that many farmers were forced to abandon their fields and move to other areas of the country or even outside it where the taxation was not as heavy, because they simply could not produce enough grain to pay the taxes, not even mentioning making a profit from the grain sales. Many farmers abandoned their fields and farming completely and took on other jobs. In such an environment every farmer was very meticulous about keeping every small bit of his harvest, even if that meant that he had to dig up ant holes and take grain from there. Also it needs to be pointed out that the amount of grain inside ant holes is not that little as I will explain in note 3 below. For a detailed analysis of the living and financial conditions of the 3rd century CE Land of Israel and proofs and sources for my summary see Daniel Sperber, “Roman Palestine, 200-400, The Land.”, Bar-Ilan University, 1978, where he discusses all of the details of life that I have mentioned. 2. As I already mentioned above in Tosefta Peah 1:10, note 17, ants that are mentioned in the Tosefta are harvester ants of the genus Messor, which are the most common ants in Israel. These ants’ main food source is grain of which they can collect vast amounts. 3. 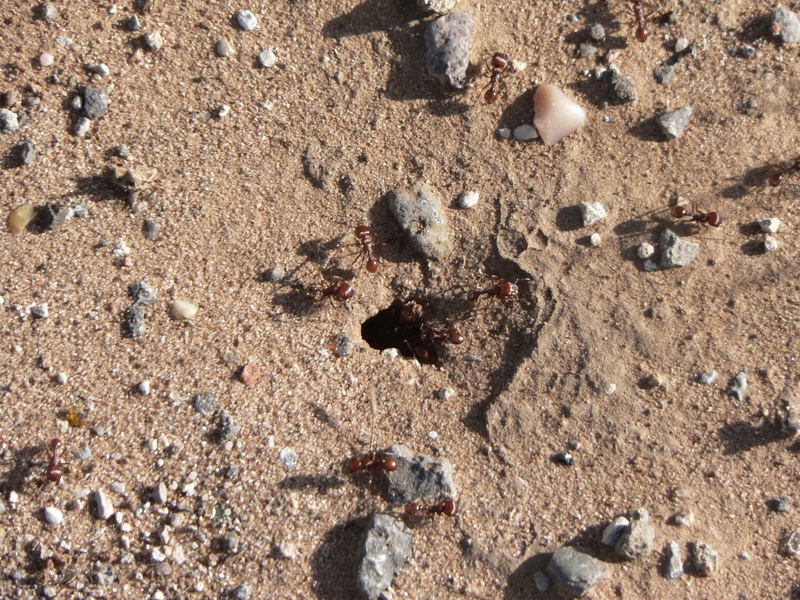 A single Messor harvester ants’ colony can take up a very large area of the field and may contain many entrances above ground spaced several meters apart from each other. Within such a colony there could be any number of ant trails but research (Claire Detrain, Olivier Tasse, “Seed drops and caches by the harvester ant Messor barbarus: do they contribute to seed dispersal in Mediterranean grasslands?”, Naturwissenschaften, 2000, 87:373–376) has shown there could be even 75 such trails within one colony. Each trail, up to 30 meters in length, can last for an average of 5 days after which the ants stop going on it and make a new trail. While the trail exists it has been estimated that ants carry on it about 50,000 seeds. Based on this research we can extrapolate a rough estimate of how much grain can the farmer retrieve by digging up a Messor harvester ant nest that was collecting grain for 1 month from a field assuming that the ants did not eat any of the grain while they were collecting it. That is over 1 ton of wheat seeds, which is a huge number. Obviously the farmer would not be able to retrieve all of it, but even if he succeeds in retrieving 10% (roughly 100 kg in our example) of the grain collected by the ants he can gain a very significant amount of grain that would be otherwise lost. You may wonder how significant a 100 kg of wheat is. According to Food and Agriculture Organization of the United Nations (FAO) the supply quantity of wheat in Israel in 2007 was 113.84 kg/capita/year. (http://faostat.fao.org/site/609/DesktopDefault.aspx?PageID=609#ancor, accessed on 06/10/2010) In other words, 100 kg of wheat can feed one person for a whole year. In poor conditions of the 3rd century CE Land of Israel such an amount of grain could mean the difference between eating well and starving. 4. In other words, according to the Tosefta the farmer is entitled to keep all of the grain collected by ants, unless he specifically says otherwise as will be stated in the next statement of the Tosefta. It seems to me that this was a special Rabbinical enactment that was made to protect the farmers from starving. As I already mentioned in note 1 the Mishna argues on the Tosefta and says that this would depend on where the ant holes which the farmer wants to dig up are located. I would like to suggest that there is a very specific reason why the Tosefta argues on the Mishna. The Mishna was written about 50 years earlier than the Tosefta, roughly in the year 220 CE. At that time the living conditions in the Land of Israel were better than in the second half of the 3rd century CE. Sometimes in the middle of the 3rd century CE the Rabbis changed the law from that of the Mishna to that of the Tosefta. The reason they passed this new enactment is clearly to protect the struggling farmers. This indicates that ants’ seeds were originally considered to be Leket only by a Rabbinical decree and not by Torah law. Clearly the Torah only obligated the stalks dropped by the farmers as Leket and not something that was taken by ants. A further proof that the law of the Tosefta was passed after that of the Mishna is that in the Mishna the law is disputed by Rebbi Meir, where as in the Tosefta it is disputed by Rebbi Meir’s student, Rebbi Shimon Ben Elazar. Rebbi Meir flourished during the first half of 2nd century CE, where as Rebbi Shimon Ben Elazar was active during the second half of the 2nd century CE when the conditions started to rapidly deteriorate. This shows that the discussion of this law took place sometimes during the end of the 2nd century CE, but it was not cemented into law by the Tosefta until the end of the 3rd century when this law was critical to protect the farmers. For a detailed analysis of how the living conditions of the Land of Israel deteriorated as the 2nd and 3rd centuries CE went on, see Daniel Sperber, “Roman Palestine, 200-400, The Land.”, Bar-Ilan University, 1978. 5. It seems to me that the reason the Tosefta says that the poor people do not violate the prohibition of theft in the case when the farmer declared the ants’ seeds ownerless, as opposed to saying it belongs to the poor people, was because it wants to emphasize that no matter what these seeds are not considered to be Leket. They either belong to the owner, or the owner made them ownerless and now they can be claimed by anyone. But they do not belong specifically to the poor people as a gift to the poor, because ants’ seeds are not considered by the Tosefta to be the same as a gift to the poor, forgotten or dropped by the owner, as was held originally, as recorded in the Mishna. 6. There is a great deal of controversy in the commentators on the Tosefta as to what the correct reading here should be. There are at least four possible readings in Rebbi Shimon Ben Elazar’s statement. I have quoted in the main text the reading from the Vienna manuscript which says נְזִיקִין (Nezikin), “damaged”. In the Erfurt manuscript the reading is נקררן גזוזין (Nikraran Gezuzin), which is not clear what the words mean here exactly. In the printed editions of the Tosefta the reading is פיקדון (Pikadon), “deposit”. And finally the Nuschaot Ktav Yad in the Vilna Talmud Bavli edition of the Tosefta quotes a forth reading which says נקברין גזוזין (Nikbarin Gezuzin), “buried and sheared”, which is also not clear in its meaning. Due to the obscurity of Rebbi Shimon Ben Elazar’s statement every commentator on the Tosefta provided his own interpretation of what he thinks it means and tried to force various words into it. Minchat Bikkurim went as far as to say that Rebbi Shimon Ben Elazar’s whole statement does not make any sense and should be deleted. However none of the commentators prefer the reading of the Vienna manuscript for unspecified reasons and do not discuss it. I have chosen that reading, because it makes most sense to me in the Tosefta and it also does not require forceful conjugation and interpretation of the actual words in this statement. The text flows freely with the word Nezikin in it, as long as it is placed in proper context. 7. I believe that the context of Rebbi Shimon Ben Elazar’s statement is as follows. He agrees with the ruling of the Tanna Kama, but provides an additional clarification. He clarifies that in the case where the owner dug up the ant holes and took out some of the seeds in them before the poor people came. When the poor people arrived some of the seeds were still left in the damaged ant nest. So the question is do we assume that the owner is done and he is not going to take any more seeds which would mean that what remains in the nest is Hefker (ownerless) and can be taken by the poor, or anyone else for that matter. Or do we assume that the owner might still come back and take what remains. Rebbi Shimon Ben Elazar clarifies that we assume that the owner may still come back and take what remains and therefore the poor people are not allowed to take it, because it still belongs to the owner. Such an extreme case further indicates the severity of the conditions of the farmers during that time and how the Rabbis tried to protect them. 1. Due to the vague language of this Tosefta it can possibly be related to one of two different Mishnayot, Mishna Peah 4:10 and 5:2. Based on the order of the Toseftot it should be related to Mishna Peah 4:10, because the next Tosefta is clearly related to Mishna Peah 4:11. However based on the wording of this Tosefta it does not really match the language of Mishna Peah 4:10 and instead more fits with the Mishna Peah 5:2. Since the language of our Tosefta is really vague it can be interpreted in a number of ways and can be made to fit with either of the Mishnayot. I have decided to explain this Tosefta in a way that fits its language best without trying to work it out with the expressions of the Mishna on which it comments. Mishna Peah 4:10 states that classification of stalks as Leket depends on the way the stalks were harvested. The Mishna is very vague in its classification and there are multiple of ways of understanding it, but in general the classification of stalks as Leket depends on whether they were harvested in a normal fashion which indicates that the owner intended to harvest them in that way as they accidentally were dropped. However, if the stalks were harvested in an abnormal fashion, such as with the back of a sickle instead of with its cutting part then the dropped stalks are not considered to be Leket, because we assume that the owner did not mean to cut them that way and therefore they were not considered to be properly harvested, which makes them still belong to the owner and they are not Leket. This Mishna does not say anything about where the stalks have landed physically in the field after they were cut off. Mishna Peah 5:2 states that if there is a single standing stalk in the harvested area then its designation as Leket depends on how close it is to the remaining standing crops that have not been harvested yet. If it is close enough to the unharvested standing crops that it can be cut off with a sickle in one swing together with some of the standing crops then it belongs to the owner and is not considered to be Leket. However, if it is further away from the unharvested standing crops that it can only be cut off by itself without any other crops then it belongs to the poor people and is considered to be Leket. According to my explanation of this Tosefta, the Tosefta states the rules for the classification of fallen stalks as Leket based on the location of the stalk in the field after the harvest relative to the areas which have been harvested already and have not been harvested yet. All three cases in the Tosefta are talking about a stalk which has been accidentally bypassed by the farmer during the harvest, either as a stalk dropped on the ground during the harvest or a stalk that was simply left standing by itself, because the farmer missed it with his sickle as he was cutting the crops. 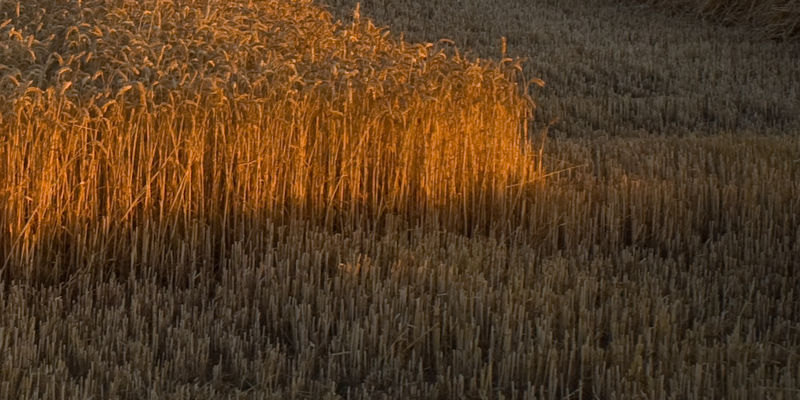 Partially harvested wheat. Photo: Lars Plougmann. Notice the still standing unharvested crops in the left upper corner of the image and a harvested area on the bottom and the right sides if the image. The three cases of the Tosefta discuss stalks in these two areas. 2. If this stalk is located among the still standing crops that have not been harvested yet then the only way for it to be identifiable is Leket is if it is detached and lying on the ground among the standing stalks. If this stalk is still attached to the ground then it is simply a part of the unharvested standing stalks and obviously belongs to the owner. 3. The reason that a fallen stalk in the unharvested area is not considered to be Leket is because we assume that it did not fall there due to the farmer harvesting the crops in a neighboring area, but rather for some other reason. Fallen stalks can be classified as Leket only if they fell as a result of the farmer harvesting the crops, however if they fell for any other reason they are not Leket and still belong to the owner. 4. It is possible to explain this particular case in two ways, either that it is referring to a fallen stalk lying on the ground or to a standing stalk still attached to the ground which was accidentally kipped over by the farmer. The first possibility is that the stalk was cut off by the farmer, fell on the ground and is now lying in the harvested area where there are no more crops. This by definition is the classic case of Leket to which the Torah refers, and therefore it is my humble opinion that there is no need for the Tosefta to state this case since it is directly meant by the Torah in its definition of Leket and is obvious to everyone. Therefore it seems to me that the Tosefta is referring to the other possibility where the stalk was accidentally missed by the farmer and it is still standing attached to the ground. Since the stalk was technically never cut off we might think that it still belongs to the owner and is not Leket. Therefore the Tosefta is coming to teach us that since this stalk ended up in the harvested area as a result of the harvesting process it is considered to be Leket and therefore belongs to the poor people. If we follow this explanation then the Tosefta is arguing on Mishna Peah 5:2. The Mishna says that such a stalk would be considered Leket only if it is far away from the still standing crops that it cannot be cut off together with them, but if it is close then it is not considered to be Leket. However the Tosefta does not make such a differentiation and implies that regardless of this stalks location relative to the unharvested area it is still considered to be Leket. To me this seems to be even a greater proof why the Tosefta specifically had to mention this case. Obviously it wanted to emphasize its different position on this law from the Mishna. Saul Lieberman in Tosefta Kifshuta points out a problem with this explanation. Most commentators on the Mishna consider this particular case to be a case of Shikcha (forgotten sheaves) and not of Leket, because the stalk was literally forgotten standing in the field as opposed to being dropped. However our Tosefta in its last statement implies that it is talking about Leket and not Shikcha. However, I am not sure that this is a real issue, because the Tosefta states three different cases and it specifically does not say what the first two cases are cases of Shikcha or Leket. Only the last case is clearly a case of Leket. It is possible that the Tosefta included a case of Shikcha among two cases of Leket, because of the similar situation in which they occurred. It is also possible that the Tosefta does not agree with this explanation that this particular case is a case of Shikcha and instead it holds that this is a case of Leket since it was a stalk that was bypassed accidentally as a result of the harvesting process, as opposed to Shikcha which generally refers to crops that already have been harvested, but not yet brought into the silo from the field and were forgotten by the farmer in the field. If these problems presented by Lieberman bother you then you can always fall back on the basic explanation that the Tosefta is merely talking about the classic case of Leket where the fallen stalk simply fell in the harvested area and is therefore Leket. In this case the Tosefta would be in agreement with the Mishna regarding the case of a single standing stalk, since it is not talking about that case at all. However, to me that explanation is inadequate for the reasons that I already mentioned. 5. The Tosefta uses the expression “behind him” to emphasize that such a stalk can be noticed by the farmer as he cuts his last batch of crops and then stops for the day leaving the rest of the crops still standing in the field, thus unharvested crops being in front of him and harvested area being behind him. The Tosefta emphasizes that the farmer should take notice and should make sure that the poor people would not be confused by such a stalk thinking that maybe it still belongs to the owner, but rather the farmer should pick the stalk up and throw it in the harvested area so that it would be clear to the poor people collecting Leket that this stalk is left there for them as Leket. 6. Since a stalk in the unharvested area belongs to the owner and a stalk in the harvested area belongs to the poor people, a stalk which lying half way in each zone is technically in a doubtful situation and has a special status of doubtfully Leket. 7. The Tosefta states a rule that any case in which a stalk has the special status of being doubtfully Leket, we always consider it as if it is really Leket and therefore it has to be left for the poor. Talmud Yerushalmi (Peah 4:7, Daf 24b) lists three possible reasons for this rule, all of which are based on derivations from verses from the Tanach, which are obviously not real derivations, but rather Asmachtot (references from the Tanach for a Rabbinical law). The Rabbis had enacted such a rule in order to make sure that the farmers respect the poor and properly treat them, especially since the amount of crops in question is really miniscule. In Mishna Peah 4:11 this rule that what is doubtfully Leket is considered to be actual Leket is stated in the name of Rebbi Meir. Talmud Yerushalmi (Peah 4:7, Daf 24a-b) in its discussion of Rebbi Meir’s opinion implies that the Chachamim (Sages) argue on him and do not hold of this rule, leaving crops in this doubtful status as such. However, the Tosefta by quoting this rule anonymously implies that this is a universal opinion accepted by everyone and therefore not being disputed.